While traveling in Bosnia and Herzegovina last summer, it was only a matter of course to make a stop in Sarajevo, the country's capital. Sarajevo is a city rich in history and religious diversity. It was where the Western and Eastern Roman Empire split, and it was also where several cultures amicably integrated. Dense and vibrant, this small city with a population of around 400,000 is a significant region where Catholicism, Islam, Orthodoxy, and Judaism has coexisted for centuries. Ranked as one of the safest city in South Eastern Europe, Sarajevo is a pleasure to visit thanks to its friendly locals and low crime rate. This cosmopolitan capital is home to many Bosniaks, Croations, and Serbians. Travelers can benefit from the exchange rates as the country is still using the Convertible Marka (BAM). Strolling through the streets and marketplace of the old town of Baščaršija (bash-char-she-yah) gave me instant memories of Istanbul, where the ambience is a blissful assortment of eastern and western elements. Being the major attraction of Sarajevo, it houses several historical buildings such as the Gazi Husrev-beg Mosque (one of the most representative Ottoman buildings in the country) and Sahat-kula (Sarajevo Clock Tower). Tunel Spasa is an underground tunnel constructed during the Siege of Sarajevo that took place during the Bosnian War. It linked the neighborhoods of Dobrinja and Butmir which had allowed food, humanitarian aids, and weaponry to be transported into the city after it was being entirely cut off by the Serbian forces. Due to the lack of skilled manpower, the tunnel had to be dug by hand 24 hours a day with each shift lasting up to 8 hours. In return, workers were paid with one packet of cigarettes daily - a highly demanded item and a prized battering possession at that time. The construction was completed on 30 June 1993 since its commencement on 1 March 1993. 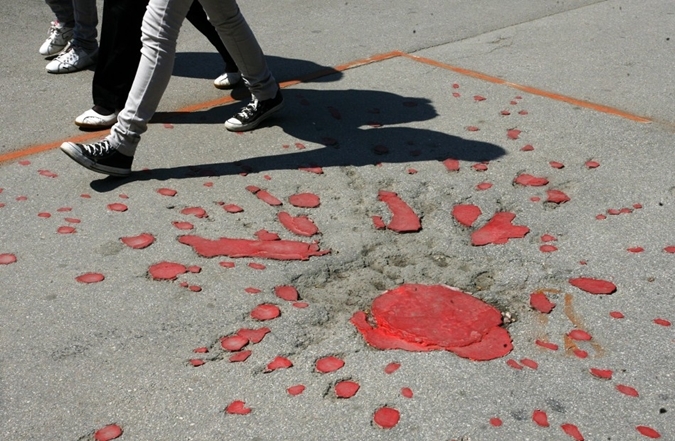 Considered the most unique feature of the city, Sarajevo Rose is a concrete scar caused by the explosion of mortar shells which created a fragmentation pattern almost similar to that of rose petals. Explosion marks have been filled with red resin throughout the city to mark the spots where actual deaths caused by mortar explosions took place. The number of Sarajevo Roses are gradually decreasing as the asphalt is being replaced. When you see one, stop for a minute to honor the casualties of war. Located on Jekovac Cliff, Žuta Tabija or the Yellow Bastion was built in the 18th century that was a part of the defensive wall for Vratnik to defend the city from attacks. It was also where a Ramadan cannon shoots to mark the beginning of Iftar. Today, it offers both locals and travelers a fantastic view of city and it remains as one of Sarajevo’s most popular vantage points. Breathtaking view from Žuta Tabija with Avaz Twist Tower and Hum Tower in the distance. For travelers with little or no knowledge of the Bosnian War, the Historical Museum of Bosnia and Herzegovina (Historijski Muzej BiH) is an excellent place to start. The museum contains more than 300,000 exhibits which allow visitors to learn about the unfortunate bloodshed that took place in the city. Read more about the must-try local Bosnian food here. The streets of Sarajevo are perfect for quiet evening strolls. With a map and a pair of reliable walking shoes, spending a few hours walking through the neighborhoods away from the city center has proven to be a delightful experience. The Martyrs' Memorial Cemetery Kovači was built in honor of the victims of the Siege of Sarajevo, which was the longest siege of a capital city in the history of modern warfare that lasted for almost four years, with a total of 13,952 fatalities including 5,434 civilians. Katedrala Srca Isusova is the largest cathedral in Bosnia and Herzegovina located in the old town district. The Catholic church is built in a Neo-Gothic style with elements of Romanesque Revival. Although it suffered damages during the Siege of Sarajevo, it has been repaired ever since. It is widely regarded as the symbol of the city.